tons of toons: boats? what boats? 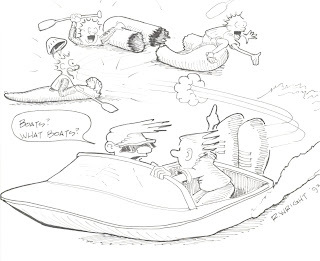 This toon was inspired by a float on the lower Klamath River, in Northern California. It was back in the mid-80's, and we floated right through a hydro-plane race. There were SO many boats zipping by us, disturbingly close!!! We dodged them the best we could, and they seemed to take absolutely no notice of us. And it wasn't like it was totally flat water. There were some pretty significant riffles going on there. But these were jet boats, which means they didn't have propellers to hit rocks with. Man, they were fast!! !